Our comment system has evolved pretty rapidly over the past few years, adding features like threaded comments, ability to follow friends and one of our newest features using your Facebook account for comments. 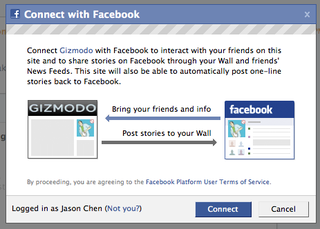 If you've always wanted to comment on Gizmodo but didn't want to sign up for yet another login, now you can comment using your Facebook account. Here's how. First, go to any post that you want to comment in. Then, click the Facebook Connect button, enter your login and you're done. Your username will have a little Facebook 'F' logo so people will know you're a FB user as well. If you don't have a Facebook account or using your FB to comment isn't really your style, you can still sign up for a good ol' Gizmodo comment account. 1) Click the "Login" link on the top right of the page and doing so will show a drop down box for logging in. Click the "new user?" link and you'll be directed to our Registration page. Fill out the form by choosing a username, password and email for your eventual comment account. 5) If you have any comment related issues or questions, feel free to send an email to comments@gizmodo.com.